This weekend, several Makerhoodies are taking part in Lambeth Open, the annual borough-wide event where artists and makers open the doors of their studios to the public. Doors are open 10am-6pm on both Saturday and Sunday 5 and 6 October, and admission is free. It’s a great chance to talk to artists and makers about their work and gain a unique insight into the creative process. Pam Williams will be showing original watercolours and sketches, prints, posters, greeting cards, Brixton postcards and the first series of four T-shirts and vests (with favourite sketches, chosen by visitors at the Brixton Makers’ Market). Ellie Laycock of Hunted and Stuffed makes beautiful and sustainable cushions from upcycled silk scarves, repurposed vintage tea towels and gorgeous vintage Japanese wedding kimono silks and gilt brocades. Maggie Winnall at Sewin Studio appliques handcut cloth letters by hand or machine onto a coloured ground fabric, to spell out meaningful words and encouraging phrases, offering positive messages for the wearer and viewer alike. Two Makerhoodies are part of Women of the Cloth, a group of female contemporary textile artists who who specialise in felting, weaving, embroidery and indigo dyeing. They will be exhibiting, selling, demonstrating and running workshops, so you can have a go at some of these skills yourself! Carol Grantham is inspired by pattern and colour. She works with felt and embroidery to explore colour and texture combinations and their effects on our feelings of wellbeing. Her workshops provide space for people to gather, chat and laugh whilst learning new skills and exploring their creative abilities. Kim Winter of Flextiles produces unique scarves, many of them upcycled and given a new lease of life through shibori dyeing with indigo. Inspired by organic patterns and forms from nature, Kim also likes to create sculptural 3D felt. Kaylene Alder spends lots of time drawing fun and quirky things that catch her imagination and then gets messy making screen prints of said drawings. Her limited edition screen prints, many of local south London scenes, will be on display at the Portico Gallery in West Norwood. 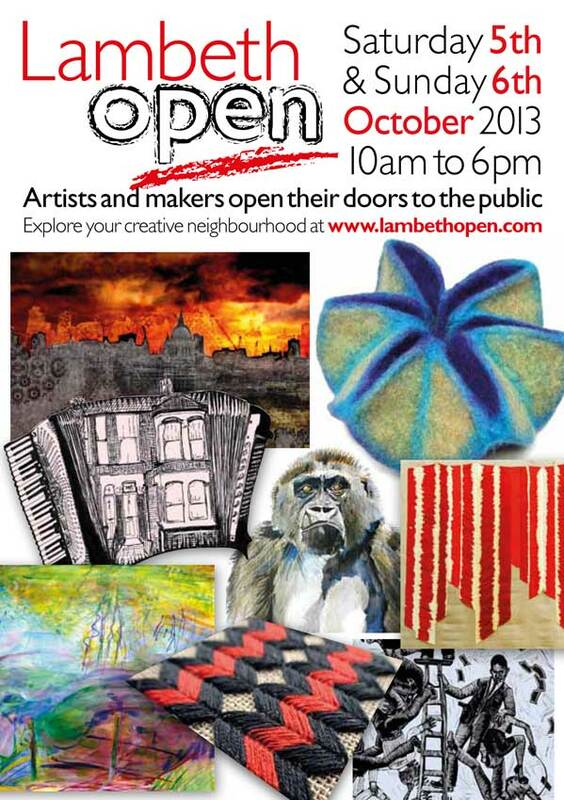 This year’s Lambeth Open takes place on 1 and 2 October. If you are an artist or craftsperson and would like to open your studio or workspace to visitors as well as selling your pieces, you need to register soon. The publicity leaflets are being printed at the beginning of August, so if you would like your details to appear on these as well as on the website, you will need to create an account at www.lambethopen.com and upload your details and pictures. Admission is completely free.